How does it affect our children? The rise of modern technology has been monumental, with the likes of smartphones, social media platforms and interactive systems. But how is this affecting our children? It seems we live in a world now where we see children as young as 2 clinging on to their mum or dad’s smartphone to watch videos or play games. At times, young tots will even know how to navigate a smartphone and know exactly how to get to the video or game they want to play. Is this impressive or scary? “It may interfere with sleep.” Kids these days have very busy schedules: after school clubs, homework to be completed, sports and other activities on the weekend. After such active days, children usually want to wind down by spending hours in front of a TV or computer when they get home, which evidently cuts into sleep time. As a result, children are finding it harder to fall asleep or stay asleep. Reduces physical activity. If children are stuck to their screens for the majority of the day, it’s likely they’re sitting on a sofa or lying in bed. This lack of physical activity will have a huge impact on a child’s health and will encourage laziness. We should encourage our kids to take part in more fun and active exercises, which will also increase brain stimulation. Something simple such as kicking a ball about outside or riding a bike will increase your children’s energy levels and also expose them to fresh air. Not to mention it will entertain them! Exposes kids to inappropriate content. Online safety is a huge concern amongst parents. Monitoring what children are doing online is vital for their safety. “Some items of technology may expose kids to too much advertising and inappropriate content.” Rather than worrying about keeping a watchful eye on kids whilst they use technological devices all the time, it’s probably best to limit their use. Avoid putting a TV in your child’s room. Turn off idle devices (i.e. TV that is on in the background with no one watching). Help your child choose a video game or a show. Give kids a time limit on screen time. Another question to consider regarding children and technology is when should a child be allowed to have their own phone, computer, or access to the internet? This is a tough question to answer as it will ultimately be up to the parents to decide whether or not they want their child to have their own smartphone and when. Most families will have a family computer or tablet that children can use and parents can monitor. Other parents may give children their own computer or laptop when they feel their kids are ‘old enough’. With technology becoming more and more advanced by the day, it’s not surprising anymore if you see a child as young as 8 with their own smartphone. Is this too young? He also touches on the safety of a child owning a smartphone, as they can become a target for crime. In fact, a recent study from The Children’s Society revealed that this is almost two-fifths of British kids’ biggest fear, so this is something to consider. However, on the other end of the scale, Vicky Mitchell wrote an article for HuffPost regarding the positive effect technology has on children. Here’s what she had to say about her experience when discussing her child’s birthday present with her partner: “When discussing what to buy our nine year old for his last birthday, my husband pitched for a basic laptop computer. My response was “No bloody way! He’ll have wholesome construction toys, craft materials and books – stuff that makes him think”. My husband won (a rare occurrence) and in the last year we’ve been living with a diminutive coder, graphic designer and animator. There’s been no shortage of thinking.” This shows that technology can have an impressive impact on young children and can open up so many doors for them in the future. 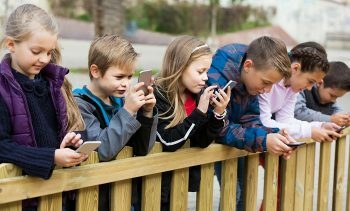 I think most people can agree however, (whichever side of the coin they are on) that we need to be mindful of the impact technology can have on children and learn how to limit use of devices so that they, and we, are not consumed by it. For more information on any of the topics featured on this blog, get in touch. We would love to hear from you.